Stephen Ministries is now active at FPC! Stephen Ministers are laypeople – Christian men & women trained to provide one-to-one care to people experiencing difficult times such as grief, divorce, job loss, chronic or terminal illness, relocation or separation due to military deployment, etc. Stephen Ministries is confidential. 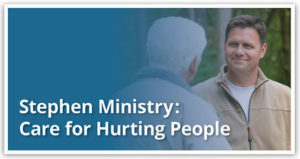 Discussions between a Stephen Minister and care receiver remain between them – nothing is shared. Stephen Ministries is Spirit lead and can be short or long term. It is a gift from your church family and may be just right for you. To inquire, please contact Gary Stevens at 906-250-9094 or at dedriverafter70@yahoo.com, or contact the Church office at 226-6587. May God richly bless you for your Love of Christ and your love of your neighbor!